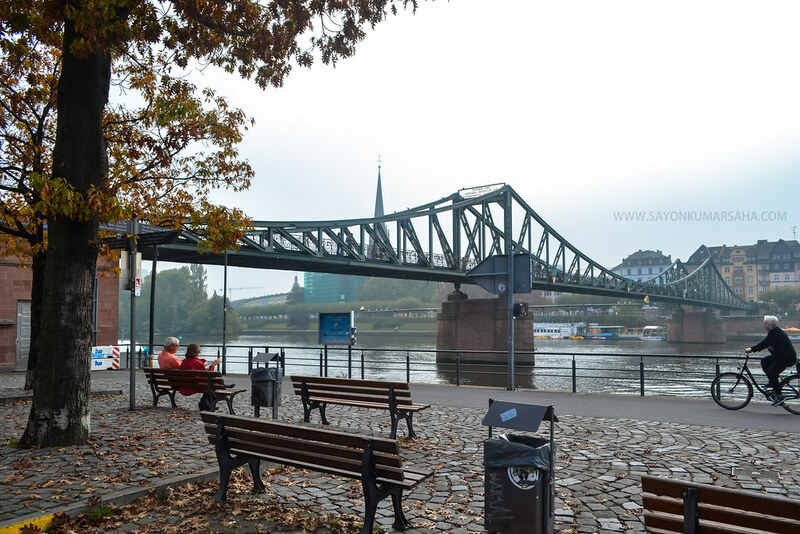 Eiserne Steg – The famous iron footbridge connects Frankfurt’s old town with the popular going out district of Sachsenhausen. That’s what the Frankfurt Tour leaflet in my hand read. A nice way to cross the main river by foot, was the motto when climbing up the bridge. No sooner did I look around, I noticed colorful locks hanging along, hundreds of them.. no wait, thousands of them, more than just thousand actually! 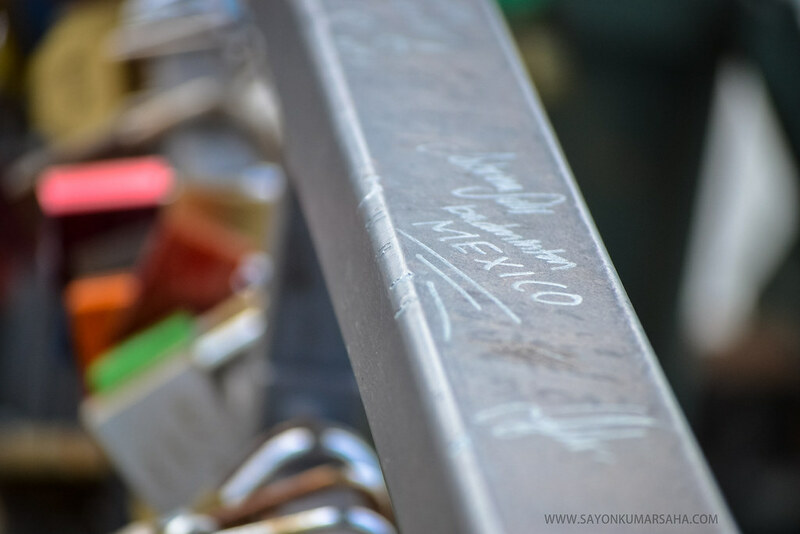 Padlocks stranded across the metal railings all over, with names engraved on them. 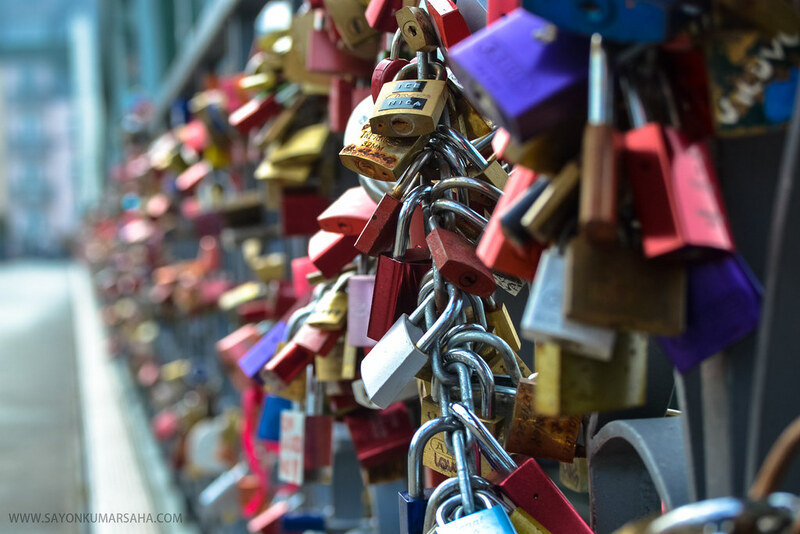 One can keep looking and going through the love locks. I turned to google to know about the custom. 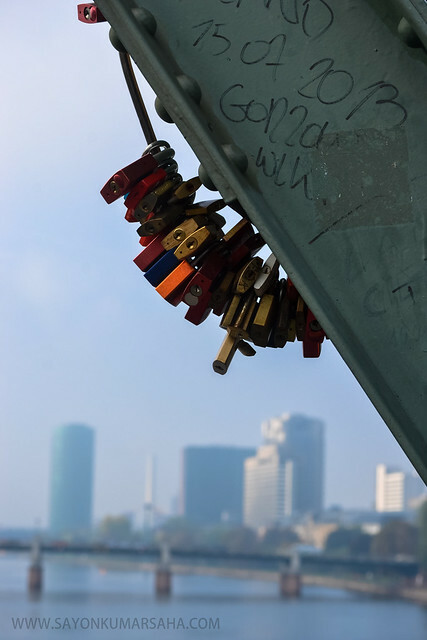 Over the years, tons of couples have come to the bridge to ‘lock’ their love with the love padlocks, inscribe their names and throw away the key! 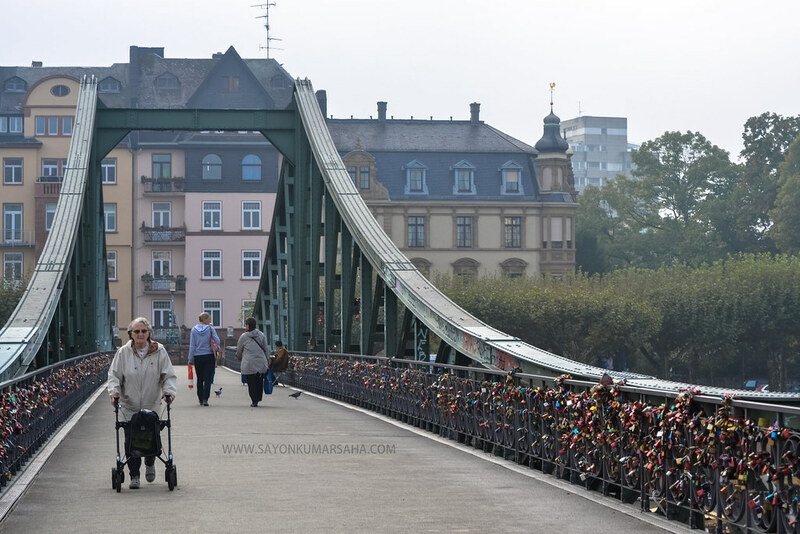 A custom that has well overloaded the iron bridge with more and more padlocks, which looks more than just an work of art. Wikipedia states that this custom first took hold in Paris. 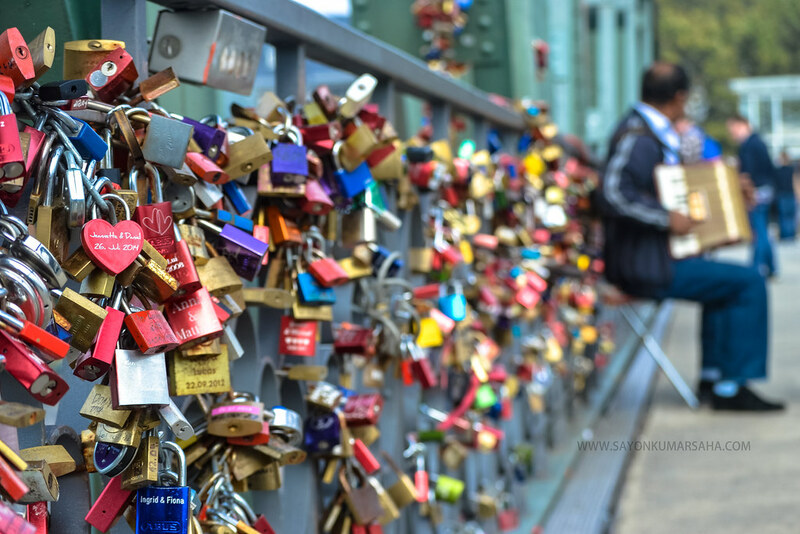 Since the popularity of the Pont de l’Archevêché love lock bridge, it has appeared all over cities in the world. 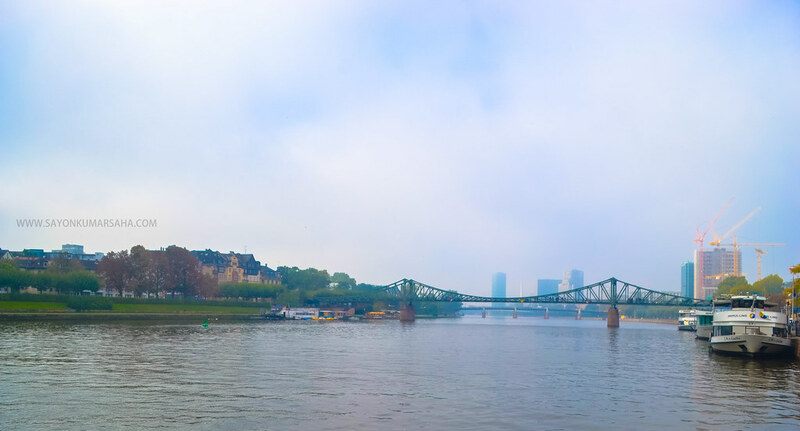 Construction of this 170-meter long pedestrian bridge began in 1868 at Frankfurt. 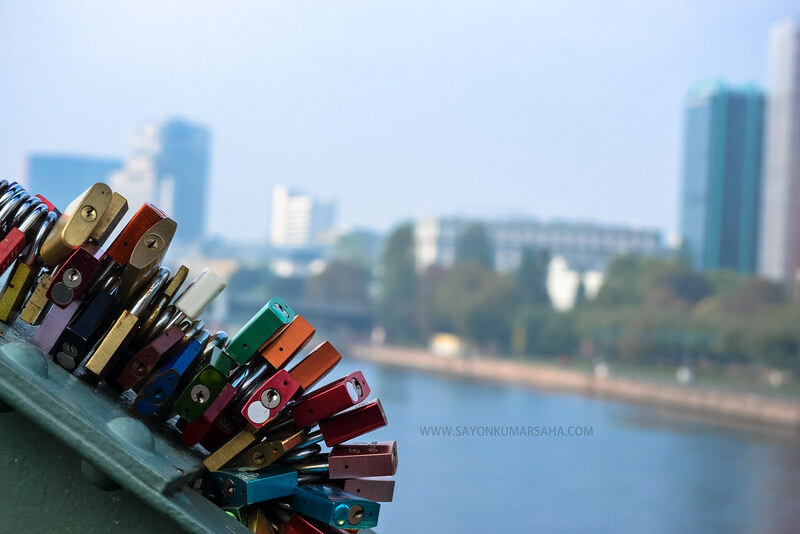 For centuries, it has seen padlocks being locked with wishes to bind two hearts till the end of the world, and the keys being thrown into the main river to not to be found again. Couples come and go with the wish of their everlasting love. The power of true love! Sayon (pronounced: Shayon) is a traveler’s soul with a camera in his backpack. He dived into photography and motion pictures when he was 17. Since then it has been one of his serious passion. Deep Learning and and Image Processing fascinates him. By profession, he is currently Data Scientist/ Software Engineer at trivago based in Düsseldorf. He concentrates on images there. He is originally from Kolkata, India. He moved to Germany in September 2014 for his masters at Technische Universität Kaiserslautern. He worked as a software developer and research assistant at the German Research Center for Artificial Intelligence- DFKI at Kaiserslautern for more than a year. 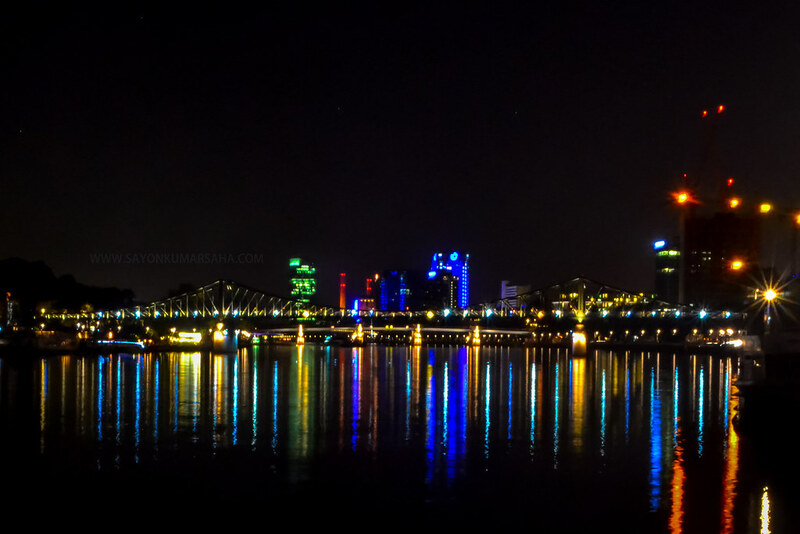 He was also living in Heidelberg for a year while working at SAP HANA Earth Observation Analytics. He likes to play table tennis when it comes to sports. Lately he has also been into running. He is a very outgoing person and likes spending time with friends and family. He loves to try out new food, cook creative recipes, explore culture, meet new people, and travel to new places. He recently wrote his journey with images at My Imagery Story with Science and Art.